Brexit: Accelerating the Drive Toward Corporate Tax Harmonisation? Brexit means the UK is no longer bound by EU Directives aimed at tackling tax avoidance and aggressive tax competition, an issue that has become a high salient electoral-political issue among citizens in EU member states. The UK will not be bound by the forthcoming Anti-Tax Avoidance Directive (which contains five legally binding anti-abuse measures that all member-states must implement by 2019); the Directive on Administrative Co-Operation (aimed at improving cross border transparency and the exchange of information); and they will most certainly not be bound by the proposed Common Consolidated Corporate Tax Base (CCCTB), should it be agreed and implemented by the Council. The UK was the loudest and most vociferous opponent of the CCCTB, and successfully blocked its implementation in the Council in the past. Whilst the “unanimity” rule still applies to fiscal policies, which means Ireland still has a veto in the Council, there can be no doubt Ireland has lost its biggest ally in arguing against a common consolidated tax base. In the context of uncertainty (and in the absence of a CCCTB), most legal-accountants are correctly pointing out that Brexit provides an opportunity for Ireland to take advantage of the present international tax situation. UK firms no longer benefit from those Directives aimed at the Single Market. Brexit means UK firms will no longer have a “one stop shop” for their EU trades. Many have an incentive to merge their businesses to an Irish subsidiary. Some will also consider moving their EU parent companies to Ireland, to ensure they can continue to transfer prices. Of course, in the medium-to-long run, everything depends on the EU-UK negotiations. As it stands, it would appear that some sort of Swiss+ type deal is the most likely outcome, with priority accorded to a sectoral-industry specific deal for London finance, including the question of passporting and equivalence. Whatever the outcome, a Swiss+ type deal (or the WTO default) will give the UK much greater scope to adopt an aggressive corporate tax regime, which, whilst subject to WTO and OECD rules, would encourage a regulatory race to the bottom in Europe. This is not good for Ireland. Further European integration reflects the direction of travel for the remaining EU member-states. This is particularly the case for those countries in the Eurozone (with growing calls for a Eurozone Treasury/Budget and even parliament). Macron and Merkel, and their finance ministers, have made it perfectly clear that the Franco-German preference is for more integration. They know the risk associated with turning the UK into the Singapore of northwest Europe, and they have publicly declared that the harmonisation of corporate income tax systems will be central to their drive toward more integration. The Commission fully support this Franco-German preference for greater tax harmonisation, which is best reflected in their recent proposal for a CCCTB. It is no surprise that Pierre Moscovici put it back on the agenda directly after the Brexit vote, despite it being defeated previously. Anyone who spends time in Brussels will know that the CCCTB is now a core priority for the EU, and they will persist until it is eventually agreed. The new CCCTB proposal is slightly different to the previous proposals. It will take place over two stages. The first stage will seek to agree a single set of EU rules to calculate the profits of MNC’s in Europe (i.e. establishing the common tax base). The second and more controversial stage will be aimed at agreeing how to divide up the profits, which is the taxable income given to member-states (based on assets, labour and sales). Ireland will lose out as MNC’s based in Ireland will no longer be able to transfer the profits of their sales in other countries back to Ireland. The second big change is that the CCCTB will be mandatory for all firms with revenue in excess of 750 million, and that there will be an R/D scheme aimed at supporting small and medium sized enterprises. But perhaps the biggest change is that the CCCTB is now being framed to explicitly tackle corporate tax avoidance in Europe. The Commission have launched a concerted campaign aimed at EU citizens to win support. Brexit will accelerate the drive to harmonise corporate income tax systems, and the probability of this being successfully passed has increased, not least because of a change in the number of votes. The EU Council now looks completely different: the votes are significantly stacked in favour of the Franco-German alliance. But on CCCTB, qualified majority voting cannot be used, as unanimity is required. However, what this means is that Germany and France will seek to win Irish, Danish, Dutch and Baltic support through consensus, and side-payments. Whether or not Ireland chooses to completely veto any attempt to introduce a CCCTB is, of course, a political question, and likely to be determined by the partisan colour of elected government. But it is worth asking whether Irish citizens would support policies aimed at harmonising the tax base, even if Irish elites would not? Ireland is already in the spotlight for facilitating global tax avoidance (not least with the Apple case). Further, Ireland makes up less than 1% of the EU population (even if one adds the Dutch, Danes and Baltic states, combined they are only a small percentage of the EU whole). Hence, is it really in Irelands long term strategic interest to veto those EU policies aimed at strengthening the problem solving capacity of Europe, post-Brexit? The future of the Eurozone is a Franco-German growth model, not an Anglo-American one. Ireland needs to decide which way to go. Author Aidan ReganPosted on May 30, 2017 May 30, 2017 Categories Uncategorized29 Comments on Brexit: Accelerating the Drive Toward Corporate Tax Harmonisation? In honour of the great critical economist Mark Blaug (1927-2011), the Foundation for European Economic Development (FEED) is financing and awarding an annual student essay prize. Rather than applying economics to a particular problem, eligible essays must reflect critically on the state of economics itself, as Mark Blaug did in many of his works. Critical reflections may include the assumptions adopted, the suitability of the concepts deployed, the mode of analysis, the role of mathematical models, the use of econometrics, real-world relevance, the presumed relationship between theory and policy, the unwarranted influence of ideology, the use (or otherwise) of insights from other disciplines, and so on. The required language is English. Eligible essays are by university undergraduates, or by graduates who obtained their Bachelor’s degree no earlier than 1 January 2016. There is no residential or geographical restriction. Essays should be submitted by email to g.m.hodgson@herts.ac.uk by 1 October 2017. The awards will be announced in late 2017 or early 2018. The Mark Blaug Student Essay Prize is promoted in collaboration with Rethinking Economics. The budget condition for 2016 was a structural balance of 0.0 per cent of GDP which was not achieved in 2016 as the structural balance was -1.7 per cent of GDP. The adjustment path condition required an improvement of 0.6 percentage points of GDP in the structural balance. This was not achieved as the improvement was 0.3 percentage points of GDP. The expenditure benchmark is designed to give the real change for an adjusted measure of government expenditure (net of discretionary revenue measures) that corresponds to the required change in the structural balance. Discretionary revenue measures (including non-indexation of the tax system) amounted to -€0.7 billion in 2016. 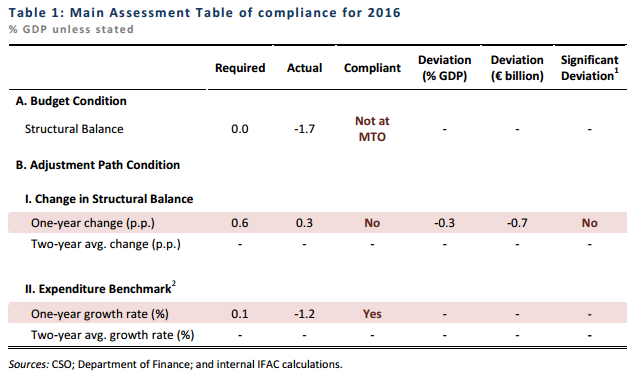 The assessment is that Ireland was in compliance with the expenditure benchmark in 2016. This contradiction between failing to achieve the required improvement in the structural balance yet complying with the expenditure benchmark is largely explained by a one-off transaction relating to AIB preference shares that took place in 2015. As the AIB transaction was not repeated in 2016, the €2.1 billion from that transaction could be replaced with other government spending without breaching the expenditure benchmark. The outturns show that around half of the €2.1 billion “space” was used for expenditure in 2016 (which will continue in subsequent years). If this one-off item is excluded from the 2016 assessment of the expenditure benchmark then it would have been breached by 0.4 per cent of GDP. The breach net of one-offs roughly corresponds to the shortfall in the required improvement in the structural balance (0.3 percentage points of GDP) which does take one-off items into account. Under the 2012 Fiscal Responsibility Act the Fiscal Council is required to assess the fiscal stance using the structural primary balance. That is, the general government balance excluding interest costs and one-off items and adjusted for the cyclical position of the economy. The primary balance itself is relatively straightforward to measure and the figures from the CSO show it to have been +0.7 per cent of GDP in 2015 and +1.7 per cent of GDP in 2016. To get the underlying changes the impact of one-off items must be removed. The Fiscal Council assesses that there were three such items in 2015 and 2016. These were the AIB transaction in 2015, while in 2016 there was the return to Ireland of a pre-paid margin related to borrowing from the EFSF and part of the EU contribution assessed to Ireland that will be non-recurring. Accounting for these, the table above shows that the primary balance net of one-offs showed close to no change in 2016 – it improved by 0.1 percentage points of GDP. The structural primary balance depends on the cyclical position of the economy, that is the difference between the actual and potential growth rates of the economy. The measurement and estimation involved in this are significant. The CSO put the real GDP growth rate for 2016 at 5.2 per cent while the potential real GDP growth rate estimated using the method set out by the European Commission is 5.1 per cent. These closeness of these numbers implies that the impact of the business cycle on the government balance in 2016 was relatively small. The change in the primary balance net of one-offs and the change in the structural primary balance are pretty much the same. 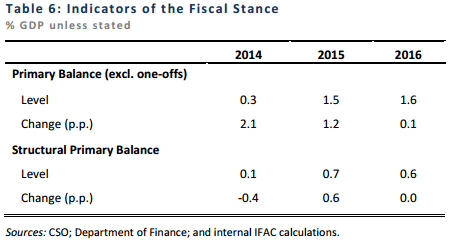 The structural primary balance is estimated to have been unchanged in 2016 which would correspond to a “neutral” fiscal stance. Your views on the fiscal stance will depend on how appropriate you think the 5.2/5.1 figures are as indicators of the real/potential growth rates of the economy in 2016. Was the Irish economy growing above its potential in 2016? What is the appropriate fiscal stance given the cyclical position of the economy? The Fiscal Council will assess these and other issues in its forthcoming Fiscal Assessment Report which is set to be published next week. Dublin Port Company has a number of vacancies including one for a transport economist. The suspension of belief is commonly needed for science fiction. Most space dramas require alien races to speak English or the existence of some form of instantaneous universal translator. It now seems that something similar is required when moving in fiscal space. Fiscal space is the money available for new measures while achieving minimum compliance with the rules. Lots of words are being used to describe this but can we tell what they actually mean? (This is a joint post with Darragh Flannery of UL and Kevin Denny of UCD). Income-contingent loans (ICLs) for students were one of the options proposed by the Cassells Report on Future Higher Education Funding when it was published last year (see here). The topic has been back in the news again in recent weeks because of the dissemination of a paper by Shaen Corbet and Charles Larkin, which claims to show that an ICL could not work in Ireland. Two of us (Doris and Flannery) have done research directly in the area of ICLs – indeed Doris’s research ended up being used by the Cassells Expert Group to provide illustrations of how an ICL might work in Ireland. We both found, using different data sets and different ICL parameters (income thresholds, repayment rates etc.) that the discounted value of loan repayments would be about 75% of the loan values, even when accounting for graduate emigration. Under these repayment rates, there would be no problem operating an ICL in Ireland. The third poster (Denny) has written papers on the determinants of participation in higher education (HE), the returns to education and related topics and so has a strong research interest in the effects of funding on access to HE. We were all surprised by the reports of Larkin and Corbet’s results and so went off to read the paper. This had added interest as the research appears to be influencing policy makers. Given this context and with apologies for the length of the post, we have decided to make our assessment of it public. Next Thursday (May 25) I will present a paper to The Statistical and Social Inquiry Society of Ireland (SSISI) on the recovery in the public finances following the financial crisis. The meeting takes place at the Royal Irish Academy on Dawson Street at 5.30pm. Details (including the paper) are available on the SSISI website here. Producing Short-Term Forecasts of the Irish Economy: A Suite of Models Approach. A new working paper from Niall Conroy and Eddie Casey of the Fiscal Council Secretariat. The Council’s mandate includes endorsing, as it considers appropriate, the official macroeconomic forecasts of the Department of Finance on which the annual Budget and Stability Programme Update are based. As part of the endorsement process and for the purposes of its ongoing monitoring and analysis of the Irish economy, the Council’s Secretariat produces its own Benchmark macroeconomic projections. This paper describes the short-run forecasting models used by the Secretariat for producing these projections. The general forecasting approach can be described as follows. Equations are used to forecast each component of the expenditure side of the Quarterly National Accounts. Multiple models are estimated for most components, with the simple model average used as an initial input into the formulation of the Benchmark projections. The out-of-sample forecasting performance of these models is assessed at each endorsement round. In addition to these model-based projections, other elements are considered. Discussions with the Council and other forecasting agencies help to guide any judgement that may be applied before arriving at the final Benchmark projections. Author Seamus CoffeyPosted on May 17, 2017 May 17, 2017 Categories Economic Performance, Fiscal Policy, Macroeconomics4 Comments on Producing Short-Term Forecasts of the Irish Economy: A Suite of Models Approach. It is now almost one year since the untimely death of Brendan Walsh. Peter Neary and Cormac O Grada have just completed a piece which provides an appreciation of Brendan’s work. In 2015 Anne Case and Angus Deaton wrote a paper documenting mortality increases among white middle-aged lower socio-economic status people in the United States. The paper attracted a lot of debate both in terms of its political implications and the complexities of the statistical analysis used to calculate the trends (see e.g. Gelman and Auerbach reply, Case and Deaton reply; Noah Smith summary of the debate). Case and Deaton have recently released another working paper that increases the scope of their original work, including the addition of a wider set of comparison groups, including Ireland. The paper is available at this link. The key table that includes Ireland is below, showing the well-documented declines in mortality during this period, that were partly offset by increases in deaths from drugs, alcohol, and suicide. The late Brendan Walsh had an excellent paper that shows what lies beneath the suicide aspect of most of these trends for Ireland, in particular the competing roles of high but declining rates of alcohol consumption and initially low but then sharply increased rates of unemployment. Richard Layte and others have written about the patterns of mortality during the bulk of this period. The declines in mortality from heart disease among this age group really gives some pause for thought. The latest Irish rental price report has just been released. As always, Ronan Lyons has done great work documenting rental-price inflation. Rental prices are at an all-time high. But Dublin is clearly diverging from the rest of the country, with what can only be described as rampant and runaway rental-price inflation, which is completely unsustainable. The media – and housing economists more generally – have correctly pointed out the importance of high-demand and weak supply. In turn, the focus is explaining the weak supply of rental properties: AirBnB etc. But what about the role of income-demand in driving up rental prices? Surely, the high-wage ICT sectors of the economy have a role to play in driving up the price of domestic non-tradeables in Dublin city? The elephant in the room is the role of inward migration, and the impact of non-Irish employment in Dublin’s Silicon Docks. The two graphs below are taken from my research on FDI flows into the ICT sector. It shows two things: FDI in the ICT sector is central to the Irish recovery, and ICT is the highest paid sector in the economy. So, who are these workers, and where do they all live? Google opened it’s offices on Barrow Street in 2004. An additional 80+ Silicon Valley firms have since followed. By 2016, the sector had grown to around 16,000 employees. Most of the growth (labour market cluster effect) is driven by inward-migration of skilled multi-lingual graduates. Might the Silicon Docks, and the inward migration of high-paid sales/tech workers from across the EMEA, explain the rental-price inflation? This is not an argument against inward migration, nor the positive effects of Dublin’s high-tech sector. It’s been great. But it has a cost, which policymakers are clearly incapable of responding to: the rapid increase in non-tradeable prices, particularly housing-rental prices in Dublin. It seems to me that it’s only a matter of time before a populist rhetoric emerges along the following lines: the Irish government use low corporate taxes to lure global MNC’s from Silicon Valley to employ mobile multi-lingual graduates from across the EU/globe, who pay 2,000 euro a month for 1-bed apartments, whilst the Irish serve them pints in the local bar. Source: Regan & Brazys (2017); IDA and authors calculations. Source: Regan & Brazys (2017); CSO and authors calculations. On behalf of the SSISI, please be advised that applications for this year’s Barrington Prize are now open. Submissions should be based on a paper of not more than 7,500 words addressing a topic of relevance to economic or social policy and of current interest in Ireland. Submission deadline: 8th September 2017. Previous winners of the prize include Rebecca Stuart (Central Bank), Ronan Lyons (Trinity College), Mark McGovern (Queens) and Yvonne McCarthy (Central Bank). The annex to the EU-27 negotiating position released yesterday in Brussels states clearly that the UK will be departing the European Investment Bank, in which it is a 16.1% shareholder. The UK will expect to be credited with the value of these shares when the exit bill comes to be totted up. How much are they worth? According to the latest accounts the EIB had net worth of €66.2 billion at end 2016, and has been posting annual profits around €2.7 billion. By Brexit Day (March 29th 2019) the UK share of net worth should be at least €11 billion, not a small amount in the context of the row about money which has already commenced. There are complications: the EIB retains all earnings and does not pay dividends, so owning shares has not been much fun. But as a result it has a CET1 ratio of 26.4 and leverage under 9, as well as a AAA credit rating, high liquidity and ECB access. This will be the last European bank to go bust. There is very substantial uncalled capital, in the UK’s case €35.7 billion. This is in effect an option against the shareholders and hence a contingent liability. However there seems to be very low likelihood that this capital will ever be called. If it were called from all shareholders leverage would drop towards 2! When the UK is ejected, who buys the shares? It could most conveniently be the EIB itself, from reserves. The bank looks to be over-capitalised. Numerous other angles will arise – the EIB shares are a substantial item and have been overlooked. Many posts on this blog are of the ‘event’ or job posting category, so I’ve created an ‘events’ tab which integrates with calendars and so forth, and this is over to the right. Posters can add a new event in exactly the same way as new posts. Readers may be interested in the evidence given by Aedin Doris, Darragh Flannery, Shaen Corbet and Charlie Larkin on the subject of income contingent loans. This is a very important job, directing something many people including me have called for for years. The particulars for the role are here. The PBO will be a key part of the new budgetary framework for the state and the Director role is obviously vital to achieving sound fiscal policy. You can apply for the job here. The Houses of the Oireachtas Service is the independent civil service agency which supports the running of both Houses of the Oireachtas (Dáil and Seanad Éireann) and provides administrative services on behalf of the Houses of the Oireachtas Commission. The establishment of the Parliamentary Budget Office (PBO) is a key strategic priority for the Oireachtas in the context of the current Parliamentary Reform Agenda. The Director will drive the establishment and shape the role of the PBO in consultation with members and other stakeholders. S/he will develop and manage the service capacity of the PBO, will set the strategic vision, provide leadership and deliver objectives. • a proven track record of significant achievement at a senior level that demonstrates leadership, management and interpersonal skills required for this role. European small open economies have often been seen as offering a path to combining competition in a globalised economy with social cohesion and equality. With increasing attention being paid to inequality and the world trade order under growing pressure, it is timely to examine once more the small open economies of Europe and ask whether they still offer a pathway to economic openness with social protection and cohesion. This conference draws together leading international scholars to explore the experiences of Denmark and Ireland, two of Europe’s most successful small open economies – albeit with very different definitions of success. Speakers include David Soskice, John Campbell, Darius Ornston, Bent Greve and Mary Murphy, Michelle Norris and Michael Byrne, Joe Ruane. The conference also presents some key findings of the comparative research of the New Deals in the New Economy project, directed by Seán Ó Riain and funded by an ERC Consolidator Grant, 2012-2017. The Annual IMF Article IV mission to Ireland is taking place for the first two weeks of May. The IMF Special Issues Papers seminar will be hosted at the new Central Bank HQ, North Wall Quay. The seminar takes place on Monday May 8th from 10am, Heaney Room, 7th Floor, Central Bank of Ireland, NWQ. For access and security arrangements can you please let internationalrelations@centralbank.ie know if you intend to come. Registration is open for the 31st Annual Irish Economic Association Annual Conference which will be held in the Institute of Banking in Dublin on Thursday May 4th and Friday May 5th, 2017.
the standard of submissions is high this year, hopefully we will see you there.